Foulques de Raigniac at Gaspard Yachts mentioned to me that he was hoping to close on the 28.6m motor yacht Cartouche at the end of August, but she is still very much for sale, and her price has been reduced by €200,000. Cartouche is a 28.6m motor yacht. She was delivered by the Couach yard in 2005 as part of the yard's 2800 Open series and is Bureau Veritas classed. Accommodation is for eight guests in a master, VIP and two twin cabins, while this superyacht's twin 2000hp MTU engines give her a range of 600 nautical miles at her cruising speed of 28 knots. 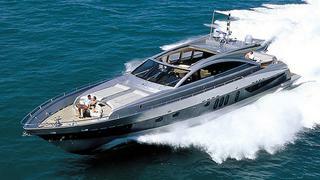 Cartouche is now asking €1,490,000 VAT paid, down from €1,700,000, and is available for inspection in Antibes.